The American Gold Eagle Coin was first issued in 1986 by the U.S. Mint. It has since risen to the rank of #1 for gold bullion investments as its weight, content, and purity are guaranteed by the U.S. government. By law, American Gold Eagle Coins must be made with gold mined in the United States. Its recognition, popularity, and liquidity make it one of the most sought-after gold coins in the world. Obverse: Features the graceful Striding Liberty design of the $20 Saint-Gaudens gold coin, which was commissioned by Theodore Roosevelt to create coins like the ancient Greek and Roman coins. Reverse: Designed by Miley Busiek. Depicts a nest of American eagles signifying the strength and security of American families. Today’s turbulent financial market has created many reasons to buy American Gold Eagle Coins. They can protect investor wealth in unstable economies and add financial security against a weak dollar and inflation. The economic recession of 2008 caused many investors to buy American Gold Eagle Coins to protect their portfolios from market uncertainty. 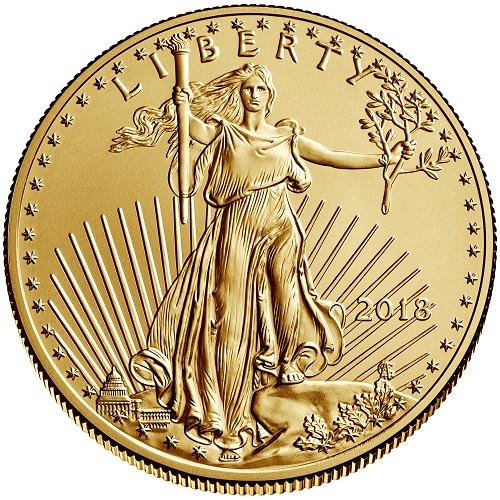 American Gold Eagle Coins are often a trusted investment no matter how volatile the financial climate, and have been known to move independently of stocks and bonds. In addition, being the most widely traded bullion coins in America, they are very liquid and can be readily bought or sold to precious metal dealers throughout the country. To add American Gold Eagle Coins to your existing IRA, former 401(k), or Gold IRA, or make a cash purchase for direct delivery, contact American Bullion toll free at 1-800-326-9598 to speak with a precious metals specialist.